Can you imagine a device that allows a quick and early diagnosis of different types of cancer -specifically, breast, prostate, lung and colorectal – just by analyzing two or three drops of blood? This is the aim of SAPHELY, a European project funded by the EU Horizon 2020 program and led by Jaime García Rupérez, researcher at the Campus of Gandia, along with researchers from the Center for Nanophotonics Technology of the UPV. The project also incorporates the SYM group from the Center for Molecular Recognition and Technological Development as a second partner of the UPV. The device that SAPHELY proposes is based on nanophotonics technology and allows rapid and ultra-sensitive microRNA-based biomarker identification, whose deregulation has been linked to many diseases. 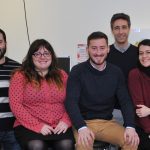 “The main innovation of this team is the combination of nanophotonic sensing technology and a new recognition system for microRNA biomarkers that enables the amplification of the effect of the interaction. This will provide an extremely high sensitivity, which can’t obtained with the current diagnostic systems,” remarks Jaime Garcia, researcher at the Center for Nanophotonics Technology of the UPV and Project Coordinator. The sensing technique could also be implemented more easily than the ones currently used, where it is necessary to carry out complex sample-preparation processes or markings to obtain such high sensitivities. According to the NTC, this will result in the possibility of obtaining very compact, lightweight and low-cost devices, with an estimated initial cost under €3,000 for each reading device. This way, SAPHELY will enable the implementation of mass screening programs, where the entire at-risk population for a particular disease can be analyzed quickly and easily. “It would help to diagnose the disease before any relevant symptoms are present, which would have a major impact on the quality of life of the public and would hugely reduce healthcare costs,” said Jaime Garcia, professor at Campus Gandia. The device could also be applied to the diagnosis of many diseases with certain deregulated microRNA biomarkers. Currently, they have identified more than 400 diseases associated with these deregulations, including such important diseases as Alzheimer’s, Parkinson’s, diabetes, osteoporosis or cardiovascular diseases, in addition to the different types of cancer. And outside the clinical setting, they are targeting its use for the detection of environmental contaminants, or bacteria, pesticides, resources, etc. food; for the analysis of the effect of new drugs; quick detection of chemical or biological threats, “and any other application requiring quick and ultra-sensitive detection of certain components,” says Jaime Garcia.